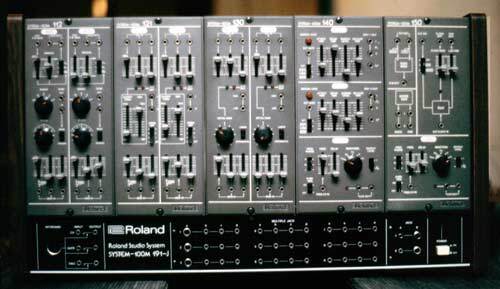 Il sistema modulare Roland System 100 M si compone di diversi moduli acquistabili separatamente, e componibili in strutture predisposte all'alloggiamento di varie dimensioni. I collegamenti tra i moduli sono realizzati tramite cavi con connettore a jack mono da 3,5 mm. I suoni prodotti da questo sintetizzatore sono di elevatissima qualità, sia per la precisione degli oscillatori, che per la bontà di vcf (e che dinamica...!!). Potete ascoltare i suoi timbri nei brani scaricabili nella sezione download. The System-100M is a flexible modular system for today's creative musician. The units was sold individually, thus making the system unique to each person's needs. The voltage controlled synthesizer is a musical instrument that contains elements which can be interconnected to build or create almost any sound imaginable. All major control and audio inputs for each module have their own input mixers which greatly simplifies patches where multiple inputs are needed. This also means that all patch cord signal levels are high for a much better signal-to-noise ratio. All module inputs and outputs are compatible so that any output may be connected with any other and with most equipment found in the recording studio. Keyboard control voltage, gate and trigger are internally connected so that patch cords are not needed for these. All modules are the same size: 104 (W) x 230 (H) x 199 (D) mm (4.1 " x 9.1 " x 7.8"). The keyboards (181, 180) include 6 connector cords for power, internal CV, GATE, and TRIGGER connections to the system. The racks (190 and 191J) contain the power supply, power switch, and voltage regulators for the modules and keyboards. Module mounting screws and the PCS-2 connection cord sets are included. Rear panel: 8-pin DIN connectors to supply power to modules; 6-pin DIN plug for expanding the system so that one keyboard may be used to control any number of additional rack systems. Available for 100V, 117V, 220V, 240V, @50/60Hz. Simulated wood ends.  Dimensions: 349(W) x 314(H) x 192(D) mm (13.7" x 12.4" x 7.56")  Weight: 5.6 kg (12.3 lb.) without modules.  190B Base for 190 is also available. 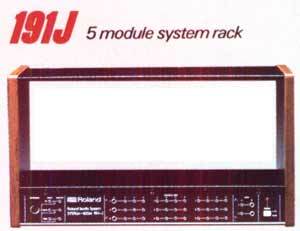 This handsome sturdy rack is capable of holding five modules and is equipped with 33 jacks for easy, fast patching. 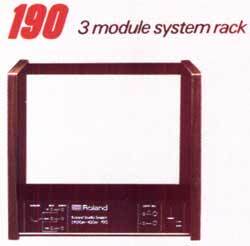 Except for its added width and weight, this rack is exactly the same as the Model 190.  Dimensions: 558(W) x 314(H) x 192(D) mm (22.0" x 12.4" x 7.56")  Weight: 6.9 k (15.2 lb.) without modules. This module contains the three main synthesizer elements, and when combined with a Model 140 module, provides all that is needed for the production of one synthesizer voice. This arrangement is particularly convenient in a computer controlled system where the generation of each voice in a composition can be assigned primarily to one module. The connections for signal flow from the VCO, through the VCF to the VCA are made internally to save patching time. Another internal connection allows a single envelope generator input to control both the VCF and VCA. All internal connections are made with switching jacks so that they can be broken. if desired. Two independent VCF's are part of this package. Each VCF includes the added feature of a built-in fixed high pass filter with a switch for turning the high pass function off or selecting one of three cutoff points. Each VCF also includes three audio and three control inputs, and LED's for following signal flow. The green LED's light when a signal appears at the outputs, the red LED's light for overdrive (distort) condition. This four-channel stereo mixer has panning on each channel. The mixer can be used in four track recording or to coordinate multiple synthesizer outputs. Also included are a stereo headphone output with completely independent level control and a convenient tuning oscillator with separate level control: 220Hz, 440Hz, 880Hz. Mixer program out-puts include left and right stereo outputs and separate mono output. Program outputs include both mini-jacks and 1/4" phone jacks for convenient connection to other parts of the synthesizer or to other studio equipment. Each program output also includes a red LED to show overload (distort) condition. The 140 module and the 110 module provide the minimum basic elements necessary to produce a single synthesizer voice. Two voices can be provided with the added use of modules 112, 121, and 130. ADS R's can be triggered from the keyboard's gate or gate + trigger, from an external gate, or manually with the front panel pushbutton. Both envelope generators provide inverted and normal outputs. Voltage controlled low frequency oscillator (LFO) has a built-in delay for delayed vibrato effects. KYBD TRIG switch allows phase locking of LFO output to keyboard trigger pulse. This module consists of two independent Voltage Control Oscillators. A variety of external controls are possible with this unit including, Pulse Width Modulation and strong and weak sync mode for phase locking. Simultaneous Manual Pulse Width Modulation is also possible. Each VCO has five different range settings from 32' to 2' as well as a Tuning control. Three different waveforms are available on each including, Triangle, Sawtooth, and Pulse. Two independent Voltage Control Amplifiers are included in this single package. Each VCA provides three audio inputs with continually variable level controls. Three VCA Modulation inputs are also included, each having its own level control. The outputs of each VCA have a low and high output jack with LED's to monitor output levels. An initial gain control that is continuously variable is included on each VCA and the user is allowed to choose between an exponential or linear response. Each mixer is a four-channel mixer with simultaneous inverted and non-inverted out-puts. They can be used for summing control voltages and/or for mixing audio signals. Both include built-in positive and negative voltage sources. A red LED indicates an over-load condition. The module also includes a separate variable positive voltage source and a separate variable negative voltage source. The most common function of the ring modulator is to combine two VCO outputs to produce metallic, bell clanging sounds. The Sample and Hold can be used for sampling an input waveform or for producing control voltage patterns based on that waveform. The musical result is patterns of notes such as arpeggios, random notes, etc. Two independent portamento controllers are included in one module. Because the porta-mento time can be controlled by an external control voltage, you can be more expressive in the musical melody. When connected with the MC-4, you can program portamento full of variety, and it is also possible to get an initial portamento even when the MPX signal of the MC-4 is off. Four signal gates and six multiple-jack channels are in this one module. Rapid and easy operation of source mix or complex patch work is possible in a home recording situation. The DC signal can be turned on and off so that the CV signal can be operated. Six channels with four jacks are in each channel, convenient for complex patch work and system expansion. This two channel, eight step analog sequencer is used for producing control voltage changes in sequence to produce such things as melodic patterns, patterned tone color changes, etc. In series mode, voltage sequences of up to 16 steps may be programmed. In parallel mode, two independent voltages can be preset for each of up to eight steps, or one of the channel outputs can be used to control the sequencer clock so that the timing between each step in the sequence can be different. Several sequencers may be used in series for longer sequences, or in parallel for more channels of simultaneous output. The phase shifter and audio delay can be used for producing spatial effects. Both include convenient effect on/off switches and can be controlled from an external control voltage source so that two units may be used together for stereo effects, or may be used as a part of the sound synthesis process itself. The built-in control LFO has both normal and inverted outputs. The gate delay can be used where it is desirable to provide a delayed output from a pulse source, or it can be used as a pulse shaper. The gate delay also has a built-in high gain amplifier with a THRESHOLD control so that low level pulses recorded on tape can be amplified and shaped into a form which will trigger synthesizer functions. This module has a four-band parametric equalizer. Each center frequency can be set exactly within the range of 20 Hz to 20 kHz, using four control knobs with overlapping effective ranges. Each frequency level can be set individually within the range of 0.9 to 9. As an equalizer this module can be used to create various tone colors, and as an effector by exaggerating the setting of each parameter.